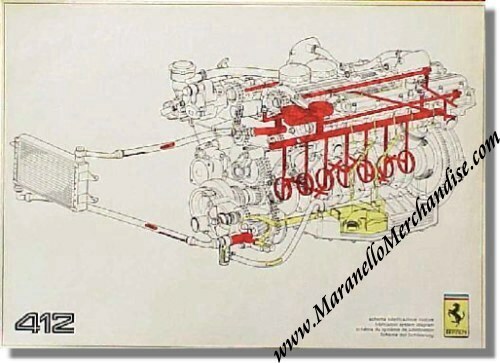 Circa 1988 Ferrari 412 Lubrication System Workshop Poster. This poster is a true Ferrari "Internal" item as they were never intended to be distributed amongst the general public but to Ferrari Workshops only. It shows the "Lubrication System Diagram". Mint condition but as with all the posters from this series, there is light "yellowing" on the edges. No Ferrari Print # but official factory issue. It measures approximately 67 x 47 cm or 26.5 x 18.5 inches. It will be shipped rolled, in a sturdy tube.